Most freshwater fish in North Carolina are safe to eat, but some fish in some waters are unsafe due to high levels of pollutants in the waterbodies. Most of this pollution comes from industrial chemicals and processes; in North Carolina, burning coal for electricity production has led to an increase in mercury levels in fish. Polychlorinated Biphenyls (PCBs), once used as an electrical coolant, and dioxins, old by-products from making paper, are also pollutants in some North Carolina waterbodies. The U.S. Food and Drug Administration and the U.S. Environmental Protection Agency issued final advice regarding fish consumption. 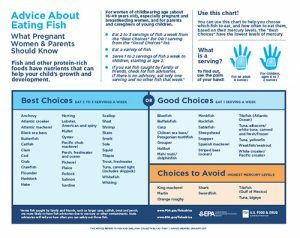 This advice is geared toward helping women who are pregnant or may become pregnant – as well as breastfeeding mothers and parents of young children – make informed choices when it comes to fish that are healthy and safe to eat. *The Fish Consumption Advisories listed on this web resource are based on data collected by the North Carolina Department of Environmental Quality, Division of Water Resources and are issued by the North Carolina Department of Health and Human Services, Division of Public Health. Refer to the North Carolina Wildlife Resources Commission for fishing regulations, size limits, and harvest limits. If your waterbody of interest is not listed in this database, it does not mean that fish from it are safe to eat; only that fish from all waterbodies in North Carolina have not been tested for all possible pollutants.